Minneapolis, MN. March 16, 2016. Advantage ID will continue their successful activities at the North American Tire & Retread Expo by exhibiting again with Marangoni Tread North America. The expo returns to the Ernest Morial Convention Center in New Orleans on April 19 – 21, 2016. At their display, Advantage ID will feature their wide variety of tire identification labels for use throughout processing and distribution. Included are barcode sidewall tracking labels, finished goods/RAR labels, warning labels, envelope tags and permanent barcode tags. Also available is an easy to use on-demand label print system, software and supplies. To help streamline tire related paperwork, Advantage ID provides standard and custom business forms, checks, envelopes and more. And for convenient orders anytime, our e-commerce website is accessible 24/7. For for further information, samples or website login info, email clientservices@advantageid.com, or call 800.328.2612 x 0. Advantage ID serves customers in over 400 locations throughout the US, Canada and Latin America. www.advantageid.com . Advantage ID is a division of Symbology, Inc. Symbology, established in 1980, is a specialty manufacturer of sequentially numbered barcode labels, featuring custom and standardized industry-specific label products for library, blood, tire, fresh produce, medical, and material handling. In addition, they are a leading provider of digital barcode files including the GS1 DataBar coupon code. An ISO 9001:2008 certified company; they also offer a complete line of inspection / verification equipment. 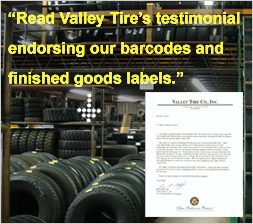 In 2012, Symbology, Inc. purchased their tire label distributor, Advantage ID and expanded their retread tire product offering. 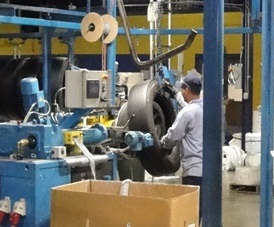 There are many places to purchase products in the tire industry. We believe Advantage ID is the best source – and our customers agree! We would be proud to add you to our list of satisfied clients.